– Serious Sam, upon shooting a Gnaar dead. 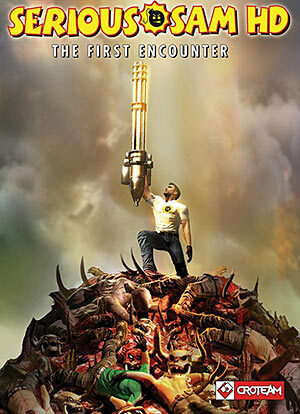 Serious Sam is a series of silly, old-school video games about shooting all the things with all the guns all the time. 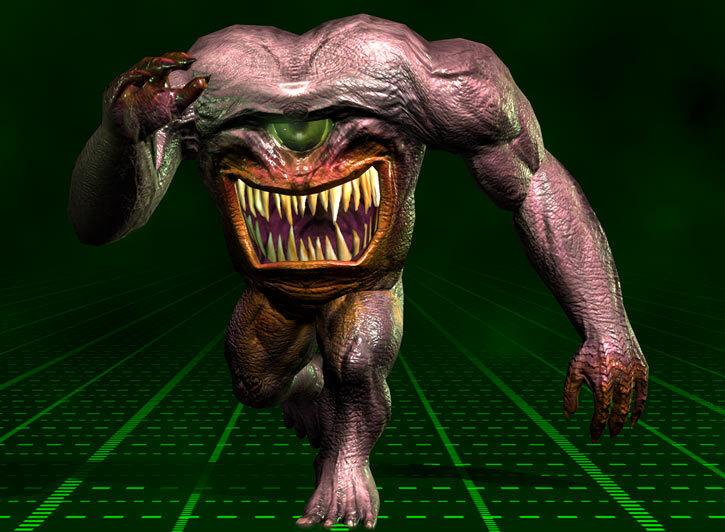 The first game was published in 2001. It involves an alien invasion, total war, time travel — and guns. Which you shoot at things. 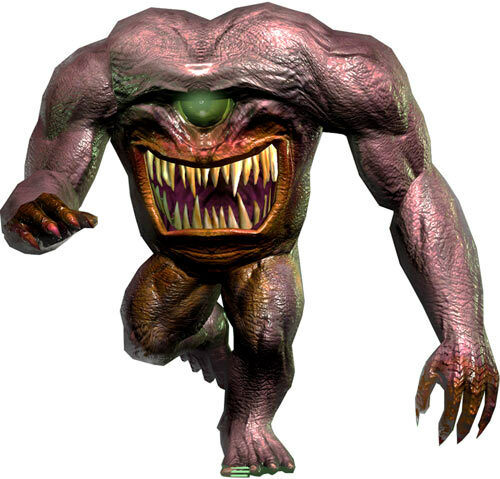 Gnaars are a basic, weak melee video game monster. Nobody cares about them, ever. This is very sad. 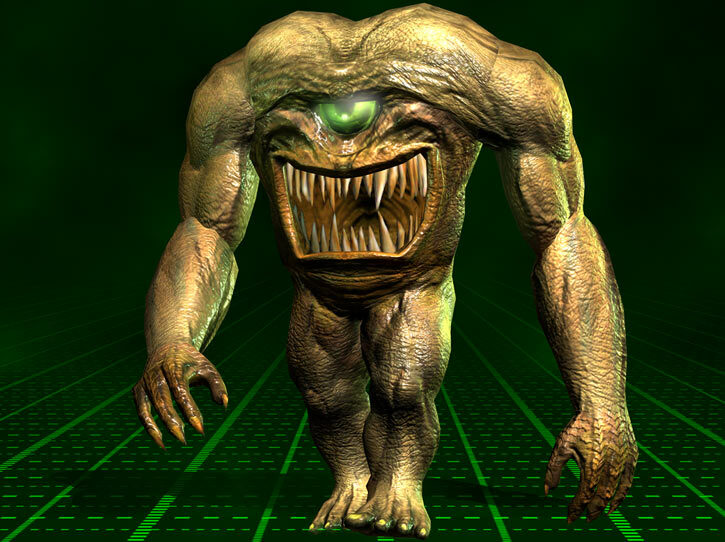 Gnaar are probably the least impressive troops of Mental. They are small, but stocky humanoid animals. They run at enemies to punch them a lot then eat the corpse. Female gnaars are bigger and tougher. For instance they can survive a shotgun blast at close range, though not by much. A few female gnaars can become almost invisible through unknown means. Some gnaars have no limbs whatsoever, and move by levitation. It is apparently a related species. Since they can fly and make less noise, they can sometimes blindside their foes. Those lousy rascals. These mammals are from Sirus. They were turned into war animals by Mental. Then they joined his space armies into ravaging Earth. But lemme tell you, they sure don’t look so smug when they run into Earth’s greatest hero, Serious Sam. No, they sure don’t. The males are about four feet high and purple. The females are about five feet high and brownish green. Gnaar are content to be left to themselves, roaming around and eating just about anything organic. But if they spot an enemy or are ordered to, they’ll blindly charge like constipated war dogs. Inf: 01 Aur: 00 Spi: 01 Wealth: N.A. MPR (monocular sight – stuff having to do with depth perception is penalised by +1CS OV/RV). STR and BODY become 03, since they’re bigger. Those rare specimens that are “invisible” (though it’s more like imperfect visual cloaking) have a version of Thief (Stealth): 03 that also works against direct visual detection. Those can be either male or female. They have a SPR (no limbs) but also have Flight: 03 and the basic Thief (Stealth): 02 Subskill. Though diminutive, gnaars evidence none of the effects of the Shrinking Power. Thus, they don’t have it. 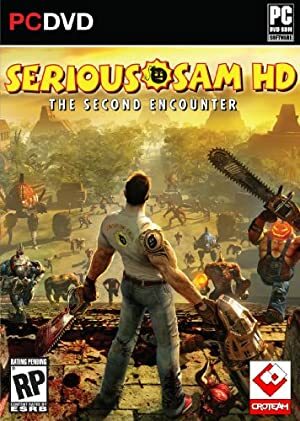 Source of Character: Serious Sam early video games. Writeup completed on the 3rd of December, 2016.